A lottery style game with elements of bingo and roulette, Keno is a game played by a lot of Australians. It is estimated that we spend almost $1 billion each year gambling on those big Keno jackpots. With potential prizes exceeding $1,000,000 (or in some cases $5,000,000), the lure of the games is obvious; big bucks for a small stake. But what is Keno, how do you play it and what are the chances of winning big? In this guide, we find out the answer to all these questions and give you some stats on just how popular the game of Keno really is. Similar in style to a lottery or bingo, Keno is a traditional Chinese game that is popular in casinos. Typically, players select their gaming numbers from a range of 1 through 80 and lay a bet. You can usually choose up to ten numbers. 20 numbers are then randomly drawn as winning numbers. Players who match all (or a combination of) numbers receive a pay-out. The game can be played electronically using gaming machines or you can participate in live games where numbers are drawn manually. Though the game is thought to have originated in China, as a means of raising public funds to help fund the building of the Great Wall of China, the widespread popularity of Keno is fairly recent. The Portuguese territory of Maccau established a lottery in 1847 in order to generate additional income for the government. It is believed that the results of the games were delivered to remote areas using carrier pigeons. This lead to the game being called báigē piào (pronounced baak-gap-piu) which translates as ‘white dove ticket’. The original game used Chinese characters instead of numbers and it was believed 120 of these were used instead of the 80 we commonly use today. During the 19th century, Chinese immigrants brought the game to the West where it became known as boc hup bu and puck-apu. It was a popular game in many Chinatowns across Australia, eventually spreading to pubs and bars. By the turn of the century, the game had become known as ‘Keno’ after the Latin/French word quine (or five winning numbers). 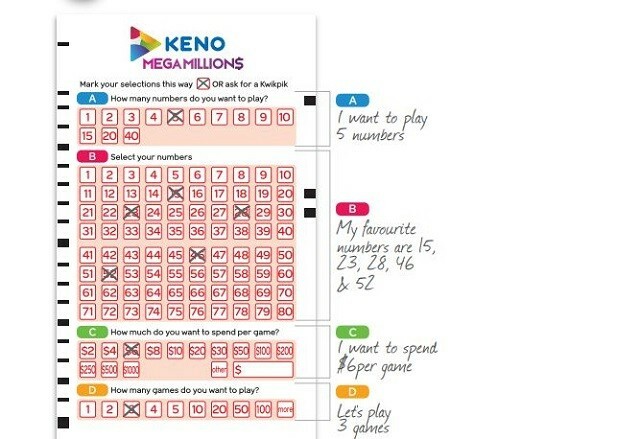 In Australia, you can play Keno at most of the state casinos but the most popular way to get involved is via the Tabcorp operated game of instant win Keno. However, the Tabcorp game is not available in Western Australia where you can only play Keno in the Crown Casino, Perth and South Australia where the games is run by SA Lotteries. 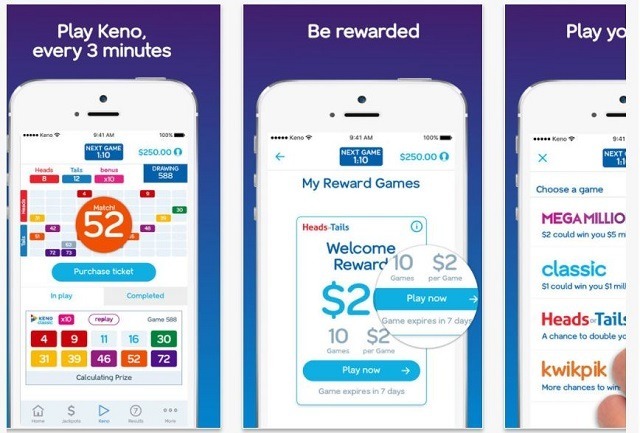 Governed by different rules depending on the state you are playing in, Tabcorp’s Keno offers a simple way to play and the chance to win some big prizes. Games can be purchased from $1 (Keno Classic) and $2 (Mega Millions) with a chance to win $1,000,000 and $5,000,000 respectively. Games can be played via the website or using the app on your iOS device whilst in a mobile play area. You can also play at Keno terminals available in pubs and clubs across the country (except WA). Live draws are played every three minutes. Keno is also available to play via online casinos like Casino Mate, Fair Go Casino and House of Jack. Rules for online gaming vary by state but are governed by the Interactive Gaming Act meaning only licensed sites situated in Australia can offer cash prize games. In Western Australia, Keno is only played in the Perth casino meaning this forms part of the casino gaming stats. Depending on where you are playing the game, there can be deviations but typically a player can choose up to twenty numbers (or ‘spots’) on a game card. Some casinos restrict the amount of spots chosen to 10, 12 or 15. Numbers are chosen from a range of 1 to 80 and marked off on a Keno game card which is laid out in a grid of 8 rows by 10 columns. Once all of the game players have selected their numbers and laid a stake, twenty numbers are selected (either by random software on electronic games or via a bingo style machine). Some Australian casinos have Keno lounges. Image via Flickr. Players must match their selected numbers with the drawn numbers to establish whether they have matched any. Winning combinations vary by casino (even by table) or venue with pay-outs depending on how much you staked and how many ‘hits’ (or numbers matched). The more numbers you select, the greater the payout but the less chance you have of hitting you minimum winning combination. Typically, selecting three spots in Keno gives you two winning combinations; 2 hits or 3 hits. With the odds of winning by selecting three spots on a Keno game being 1 in 20 your chances may be good but the potential gains are low. Selecting 10 spots gives you six possible winning combinations (5 hits, 6 hits, 7 hits, 8 hits, 9 hits and 10 hits) but a lower chance of getting a winning combination. The odds of winning on a 10-spot card are 1 in 253 but can deliver better returns. The probability of winning the jackpot (all twenty spots) are virtually impossible at 1 in 3.5 quintillion. 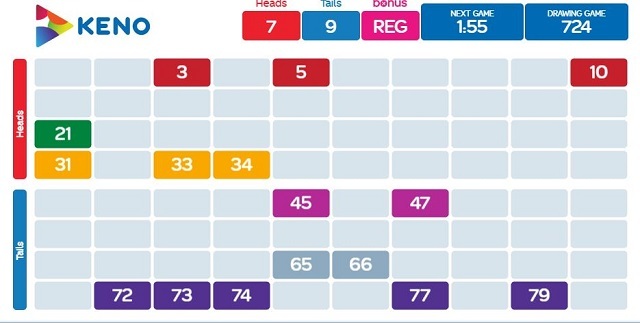 Most Keno players stick to less than 10 spots per card with those wanting to play the best game of probabilities, playing 4,5 or 6 spot games. The odds of a win on this number of potential hits is around 1 in 5. Playing Keno is as simple as playing the Lotto. Image via Keno Game Guide. Keno prizes vary by operator with casinos often offering progressive prize jackpots which can grow to over $250,000. The main lotteries run Keno jackpots exceed $1,000,000 for 10 spot wins. Featured image via Apple iTunes iOS Store.